Over the past week, Mojang have announced and released their first 1.9 snapshot “15W31C” for users to check out which includes a huge amount of awesome additions to the end, additional blocks, crops and more! Here’s our little round up, where we’ll show you what’s already here and what to expect in later snapshots! Though 1.9 was confirmed to include shields, quivers and other combat additions – Mojang hasn’t released these features in their first snapshot and has stated that instead they’ll be coming soon. First off, lets take a look at the changes in the fight with the Ender Dragon and the End! The battle with Ender Dragon has only gotten more difficult with this update with two new abilities given to the Ender Dragon; now, she can breathe purple fire and throw fire charges at the player. Additionally, she’s a lot more protective of the obsidian pillars too, which now feature cages protecting some of the beacons. Notably, in the ‘arena’ of the End, the end portal is pre-spawned in the centre of the pillars, which changes into an active portal once you defeat the dragon so you can make your escape to the overworld. Interestingly enough, the only time you can do good damage to the dragon is when it stops and hover over this structure – almost like she’s protecting it. Once you defeat the ender dragon, a small bedrock and portal structure will spawn floating in the sky somewhere nearby. So you can choose to use the normal portal and go home, or throw an enderpearl through the portal block on this new portal and go on a whole new adventure! If you do, you’ll be taken to the end city. The end city is a beautiful, strange structure made up of new blocks and mobs located in a completely new area. It features loot chests in the city itself and in the flying ships. The whole city is protected fiercely by the Shulkers – a brand new, heavily armoured mob that gives you a ‘levitation’ effect when you take damage from it. Although levitation sounds fun, it isn’t when you might fly off so high that you’ll take a lot of fall damage when the effect runs out! Let’s talk about the new blocks and items! The End City landscape is covered with Chorus fruit plants – which are farmable. Chorus fruit is an awesome new addition to Minecraft as it’s edible, and when you eat it you’re teleported to a random nearby location which is super handy for finding new caves and dungeons when you’re mining! ‘Popped’ Chorus fruit are a variant of the item that you get when you cook Chorus fruit in a furnace. Crafting 4 popped Chorus together gets you some purpur bricks which are the purple bricks shown above. With those, you can craft the matching slabs, stairs and pillar blocks that also make up End City. 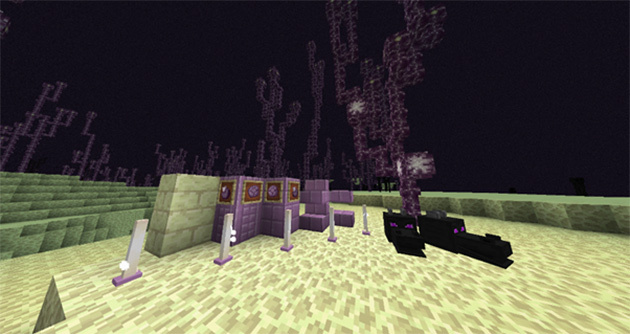 End city is lit by ‘End Rods’ – glowing white rods with purple bases that can be stacked on top of eachother. Speaking of bricks, End Stone can finally be crafted into bricks too! And last but not least for the end – Dragon heads. The dragon head is a drop you receive from killing the Ender Dragon that can be worn, used as decoration and utilized with Redstone. When it receives a redstone signal, the mouth moves. Back in the overworld, we’ve got a new crop to add to our farms! Beetroot is a farmable source of red dye and can be crafted into soup. You can get beetroot seeds by tilling the ground. As a part of the combat side of the update, potion tipped arrows were introduced. When an enemy or player is shot with an arrow, they get the effect of the potion put on the arrow. So I guess, you could also shoot people with a healing arrow! Additionally, a ‘spectral arrow’ was added. Spectral arrows cause the target to glow for a short amount of time which could be useful for minigames and more. The feature is not yet complete. Lastly for this snapshot, Dual Wielding has been somewhat ‘implemented’ but isn’t functional. You can hold two items at once, one in the offhand ‘shield’ slot as seen in the inventory and to the left of the hotbar. It does look pretty cool! To get the snapshot, open your Minecraft launcher and press the New Profile button. Name it something like snapshots and check the box saying “Enable experimental development snapshots” select the snapshot e.g. “15w31c” and hit save. Wow so many cool new features. Hope 1.9 releases soon.